"Do Not Be Afraid to Believe, to Hope, and to Love"
This Mass marked the publication of the "instrumentum laboris" of the Second Special Assembly for Africa of the Synod of Bishops. How can we enter into the specific grace of this day? In a little while, at the end of Mass, the liturgy will remind us of the focal point of our meditation when it has us pray: "Lord, today you nourish us at this altar as we celebrate the feast of Saint Joseph. 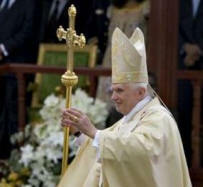 Protect your Church always, and in your love watch over the gifts you have given us." We are asking the Lord to protect the Church always -- and he does! -- just as Joseph protected his family and kept watch over the child Jesus during his early years. Our Gospel reading recalls this for us. The angel said to Joseph: "Do not be afraid to take Mary your wife into your home," (Mt 1:20) and that is precisely what he did: "he did as the angel of the Lord had commanded him" (Mt 1:24). Why was Saint Matthew so keen to note Joseph’s trust in the words received from the messenger of God, if not to invite us to imitate this same loving trust? Although the first reading which we have just heard does not speak explicitly of Saint Joseph, it does teach us a good deal about him. The prophet Nathan, in obedience to God’s command, tells David: "I will raise up your heir after you, sprung from your loins" (2 Sam 7:12). David must accept that he will die before seeing the fulfillment of this promise, which will come to pass "when (his) time comes" and he will rest "with (his) ancestors". We thus come to realize that one of mankind’s most cherished desires -- seeing the fruits of one’s labors -- is not always granted by God. I think of those among you who are mothers and fathers of families. Parents quite rightly desire to give the best of themselves to their children, and they want to see them achieve success. Yet make no mistake about what this "success" entails: what God asks David to do is to place his trust in him. David himself will not see his heir who will have a throne "firm for ever" (2 Sam 7:16), for this heir, announced under the veil of prophecy, is Jesus. David puts his trust in God. In the same way, Joseph trusts God when he hears his messenger, the Angel, say to him: "Joseph, son of David, do not be afraid to take Mary your wife into your home. For it is through the Holy Spirit that this child has been conceived in her" (Mt 1:20). Throughout all of history, Joseph is the man who gives God the greatest display of trust, even in the face of such astonishing news. Dear fathers and mothers here today, do you have trust in God who has called you to be the fathers and mothers of his adopted children? Do you accept that he is counting on you to pass on to your children the human and spiritual values that you yourselves have received and which will prepare them to live with love and respect for his holy name? At a time when so many people have no qualms about trying to impose the tyranny of materialism, with scant concern for the most deprived, you must be very careful. Africa in general, and Cameroon in particular, place themselves at risk if they do not recognize the True Author of Life! Brothers and sisters in Cameroon and throughout Africa, you who have received from God so many human virtues, take care of your souls! Do not let yourselves be captivated by selfish illusions and false ideals! Believe -- yes! -- continue to believe in God -- Father, Son, and Holy Spirit -- he alone truly loves you in the way you yearn to be loved, he alone can satisfy you, can bring stability to your lives. Only Christ is the way of Life. God alone could grant Joseph the strength to trust the Angel. God alone will give you, dear married couples, the strength to raise your family as he wants. Ask it of him! God loves to be asked for what he wishes to give. Ask him for the grace of a true and ever more faithful love patterned after his own. As the Psalm magnificently puts it: his "love is established for ever, his loyalty will stand as long as the heavens" (Ps 88:3). Just as on other continents, the family today -- in your country and across Africa -- is experiencing a difficult time; but fidelity to God will help see it through. Certain values of the traditional life have been overturned. Relationships between different generations have evolved in a way that no longer favors the transmission of accumulated knowledge and inherited wisdom. Too often we witness a rural exodus not unlike that known in many other periods of human history. The quality of family ties is deeply affected by this. Uprooted and fragile members of the younger generation who often -- sadly -- are without gainful employment, seek to cure their pain by living in ephemeral and man-made paradises which we know will never guarantee the human being a deep, abiding happiness. Sometimes the African people too are constrained to flee from themselves and abandon everything that once made up their interior richness. Confronted with the phenomenon of rapid urbanization, they leave the land, physically and morally: not as Abraham had done in response to the Lord’s call, but as a kind of interior exile which alienates them from their very being, from their brothers and sisters, and from God himself. Is this an irreversible, inevitable development? By no means! More than ever, we must "hope against all hope" (Rom 4:18). Here I wish to acknowledge with appreciation and gratitude the remarkable work done by countless associations that promote the life of faith and the practice of charity. May they be warmly thanked! May they find in the word of God renewed strength to carry out their projects for the integral development of the human person in Africa, especially in Cameroon! The first priority will consist in restoring a sense of the acceptance of life as a gift from God. According to both Sacred Scripture and the wisest traditions of your continent, the arrival of a child is always a gift, a blessing from God. Today it is high time to place greater emphasis on this: every human being, every tiny human person, however weak, is created "in the image and likeness of God" (Gen 1:27). Every person must live! Death must not prevail over life! Death will never have the last word! Sons and daughters of Africa, do not be afraid to believe, to hope, and to love; do not be afraid to say that Jesus is the Way, the Truth and the Life, and that we can be saved by him alone. Saint Paul is indeed an inspired author given to the Church by the Holy Spirit as a "teacher of nations" (1 Tim 2:7) when he tells us that Abraham, "hoping against hope, believed that he should become the father of many nations; as he had been told, ‘So shall your descendants be’" (Rom 4:18). "Hoping against hope": is this not a magnificent description of a Christian? Africa is called to hope through you and in you! With Jesus Christ, who trod the African soil, Africa can become the continent of hope! We are all members of the peoples that God gave to Abraham as his descendants. Each and every one of us was thought, willed and loved by God. Each and every one of us has a role to play in the plan of God: Father, Son and Holy Spirit. If discouragement overwhelms you, think of the faith of Joseph; if anxiety has its grip on you, think of the hope of Joseph, that descendant of Abraham who hoped against hope; if exasperation or hatred seizes you, think of the love of Joseph, who was the first man to set eyes on the human face of God in the person of the Infant conceived by the Holy Spirit in the womb of the Virgin Mary. Let us praise and thank Christ for having drawn so close to us, and for giving us Joseph as an example and model of love for him. Dear brothers and sisters, I want to say to you once more from the bottom of my heart: like Joseph, do not be afraid to take Mary into your home, that is to say do not be afraid to love the Church. Mary, Mother of the Church, will teach you to follow your pastors, to love your bishops, your priests, your deacons and your catechists; to heed what they teach you and to pray for their intentions. Husbands, look upon the love of Joseph for Mary and Jesus; those preparing for marriage, treat your future spouse as Joseph did; those of you who have given yourselves to God in celibacy, reflect upon the teaching of the Church, our Mother: "Virginity or celibacy for the sake of the Kingdom of God not only does not contradict the dignity of marriage but presupposes and confirms it. Marriage and virginity are two ways of expressing and living the one mystery of the Covenant of God with his people" (Redemptoris Custos, 20).